It’s easy to make delicious keto whipped cream in the food processor. And it’s the perfect topping for berries, mug cakes, and crustless pies. This keto whipped cream is amazing. It’s rich, fluffy, and not overly sweet. I sweeten it with stevia glycerite, my favorite sweetener these days. I like it because it doesn’t cause digestive distress like sugar alcohols. And the glycerite version doesn’t have the aftertaste that other stevia products have. It’s easy to make low carb whipped cream! I adore whipped cream. Always have. Many years ago, when I just started dating my now husband, I was sitting with him in a posh restaurant. It was the end of a good meal. Perusing the dessert menu, I spotted a dessert that was topped with whipped cream. Suddenly, all I wanted was a small bowl of whipped cream! But I was too embarrassed to ask the server if that would be possible. Now I eat a low carb diet. But luckily, whipped cream is one of those desserts that’s very easy to turn keto. You simply omit the sweetener, replacing it with a low carb sweetener. The ratios are pretty universal. 1 cup of liquid heavy cream, 2 tablespoons of sweetener (so in our case 1/2 teaspoon stevia glycerite), and a little vanilla. I make this keto whipped cream in the food processor. I have found that if you have a food processor with a “high” setting, this is pretty much a foolproof way to make great whipped cream with minimal effort. There’s no need for everything to be cold (normally you would need to chill the mixing bowl and the whisks). The food processor is very powerful, and it whips a cup of heavy cream beautifully in about 2 minutes. Just keep an eye on it. Whip only until soft peaks form, then stop. Try not to overbeat the cream, or it could separate and become grainy. But if that happens, a simple fix is to add more liquid cream and re-whip. But is heavy cream healthy? New research tells us that it’s not as bad as once thought. If you’re thinking about replacing whipped cream with a fake “whipped topping”, consider that the list of ingredients in Cool Whip, Original is: Water, Hydrogenated Vegetable Oil (Coconut and Palm Kernel Oils), High Fructose Corn Syrup, Corn Syrup, Skim Milk, Light Cream, Contains Less than 2% of Sodium Caseinate, Natural and Artificial Flavor, Xanthan and Guar Gums, Polysorbate 60, Sorbitan Monostearate, Beta Carotene (Color). While the list of ingredients in Straus organic heavy cream is: Pasteurized organic cream. Can you make whipped cream in advance? You can make this keto whipped cream in advance, but not too far in advance. I find that it keeps in the fridge for 1-2 hours, but after that, it starts to revert back to its liquid form. Keto whipped cream is obviously wonderful as a topping to berries. It’s also great with chocolate pie, keto microwave cheesecake, peanut butter mug cake, and low carb strawberry shortcake. It’s easy to make delicious keto whipped cream in the food processor. Sweetened with stevia and flavored with vanilla, it’s the perfect topping for berries, mug cakes and crustless pies. 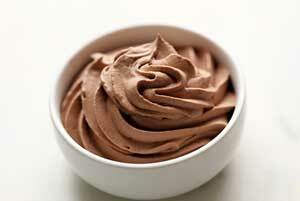 Place the whipping cream, stevia and vanilla in your food processor bowl. Process on high until soft peaks form, about 2 minutes. Use immediately, or chill up to 2 hours.